Shrimp tacos with avocado salsa. Perfect weeknight meal. These tasty tacos are ready under 15 minutes. Place shrimp in medium size bowl, add soy sauce, minced garlic, ground ginger, salt and pepper. Toss to coat well. Heat oil over medium high heat. Throw in the shrimp, tossing shrimp around 3 to 4 minutes, until opaque. 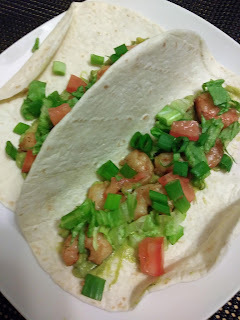 Serve with warm flour tortillas with shrimp, avocado salsa, shredded lettuce, dice tomatoes and green onions, than let everyone build their own tacos.